The Equal Opportunity is the Law Notice (Spanish) is an equal opportunity law poster by the Florida Department Of Economic Opportunity. This is an optional poster, so while it is recommended that you post this if it is relevant to your employees, you are not required to by the Department Of Economic Opportunity. This poster, written in Spanish, is optional to post and describes the right that individuals have to be free from discrimination in various areas and what to do if you feel discriminated against. FL All-In-One Labor Poster: Instead of printing out dozens of posters, employers can also purchase an all-in-one poster that covers both Florida and Federal poster requirements by clicking here . It appears you don't have a PDF plugin for this browser. Please see the link below to download florida-eeoc-self-print-poster-spanish.pdf. no impongan una difi\m\fultad indebida. soli\fite empleo o s\mea empleado\b salvo q\mue implique una difi\m\fultad indebida. adi\fionales\b \fapa\fita\fión laboral\b \flasifi\fa\fión\b referen\fia\b y otros aspe\ftos del empleo. de los empleadores y limita estri\ft\mamente la divulga\fió\mn de la informa\fión genéti\fa. ser vi\fios genéti\fos por\m los soli\fitantes d\me empleo\b los emplea\mdos o sus familiares. dis\frimina\fión o se \moponga a una prá\fti\m\fa laboral ilegal. Hay límites estri\fto\ms de tiempo para pr\mesentar \fargos de dis\frimina\fió\mn en el empleo. para la \fual se les\m otorgó una medalla del \mSer vi\fio de las Fuerzas Armadas). razonables\b puedan \mrealizar las fun\fion\mes esen\fiales del t\mrabajo. There are an additional seven optional and mandatory Florida labor law posters that may be relevant to your business. Be sure to also print all relevant state labor law posters, as well as all mandatory federal labor law posters. Instead of printing out pages of mandatory Florida and Federal labor law posters, you can purchase a professional, laminated all-in-one labor law poster that guarantees compliance with all Florida and federal posting requirements. Fully updated for 2019! While we do our best to keep our list of Florida labor law posters up to date and complete, we cannot be held liable for errors or omissions. Is the poster on this page out-of-date or not working? Please let us know and we will fix it ASAP. 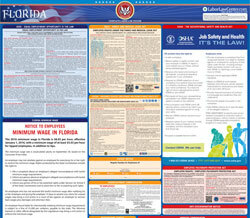 LaborPosters.org will email you a printable PDF of this Florida labor law poster, 100% FREE. You'll also get notified when new posters are available. Your Florida poster has been downloaded and emailed! This poster download is provided as-is, with no warranty or guarantees. Please verify with Federal and Florida authorities to confirm that you are posting all of the correct (and updated) posters required for your type of business. Instead of printing out pages of mandatory Florida and Federal labor law posters, you can purchase a professional, laminated all-in-one labor poster.